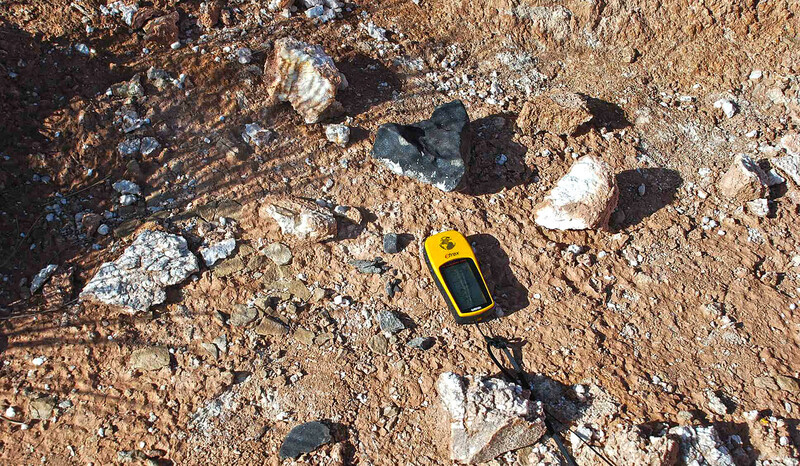 Several professional Moroccan meteorite prospectors launched search campaigns immediately after the first reports of a fireball sighting spread. The terrain in the foothills of the High Atlas is challenging to say the least. Unlike the Hammadahs and Serirs of the Sahara desert, it can not be searched by car due to steep ravines, boulder fields and numerous canyons and dry riverbeds with steep cliffs. It took the distinguished hunters two weeks to locate the first fragments by the help of local villagers. On January 3, 2009 A. Habibi reported the first chondritic finds on the Meteorite Central mailing list. Fragments were sent to scientific institutions and distributed among collectors only days later under the synonyms “Taliouine”, “Ticka” “Tamdakhte” and “Tamdaght”. The weather in the strewn field did change in the second week of January, from a dry cold to slight rain and storm. Thus search and preservation conditions for the meteorites still out in the field had worsened. While the first few reported finds displayed no or only minimal signs of oxidation, the finds from the end of January already show some rust halos around the iron aggregates visible on fractured surfaces. As the number of recovered fragments went from two to ten it became clear that the bolide had fragmented and produced a strewn field. Many of the reassembled masses show angular shapes indicating that they stem from a larger mother body detonated in flight. The explosion sounds reported by the eye witnesses support the idea of one ore multiple fragmentations. Individual specimens of the Tamdakht meteorite show a thick (0.7 – 1.1 mm) fusion crust, indicating that the ablation process must have continued until well after the fragmentation. However, no eye witness did report having seen multiple fireballs. The fusion crust of the Tamdakht meteorites shows a rough, vesicular texture and often displays bubbles in the submilimeter scale. Challenging terrain and worsening weather conditions hamper the search in the Tamdakht meteorite strewn field. Photo courtesy of M.Aid. The strewn field was reported to stretch from Tourdjale to Oued. 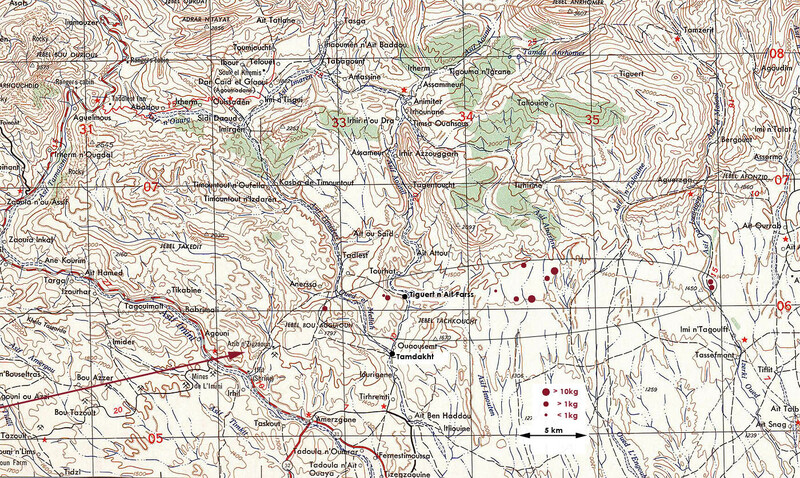 We could not locate these settlements on our topographic maps but we have been sent GPS find locations by three different finders who found a total of 12 masses. The documented find locations are given in the map below. These meteorites have been found 6 – 15 km northwest, north and northeast of the city of Tamdaght (Tamdakht), at both sides of the Jebel Tachkoucht. By clicking on the map below the reader may view a lerger map with the distribution ellipse marked. Please note that this data at present may cover only a part of the actual strewn field and that several find locations must be considered uncertain depending further research. (Click in the map to view a large size version). The larger meteorites (>10 kg) were located on the southern flanks of the Jebel Anrhomer whose peak touches the sky at an altitude of 3607 meters. The terrain is shaped by dry river beds with a south orientation, which have cut into the limestone and clay bedrock. The common soil type in the wadis of the Asif Imouten and the Asif Anarhra are alluvial gravels composed of limestone, red sandstone, dolocretes and clay. The higher banks with little or no hydraulic gradient often show a blanket of a dark red laterite soil. The find locations are situated in altitudes of 1500 to 1600 meters. Many masses which have been found until present, including those with weights below 1 kg, are commonly broken into many fragments due to the forces of impact. 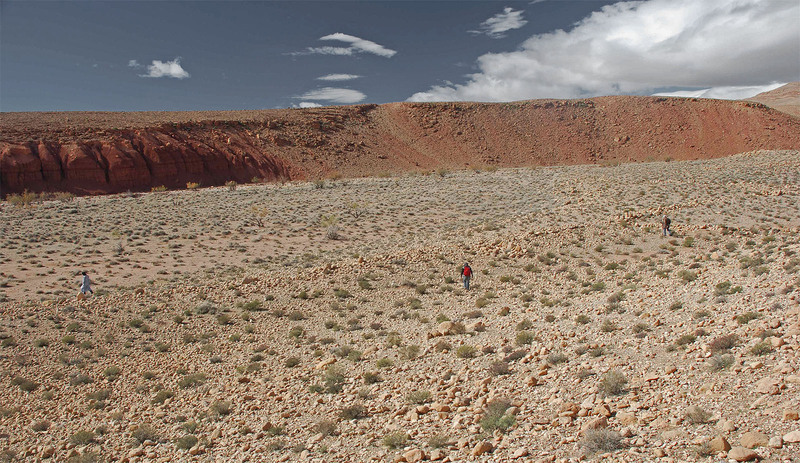 The horizontal trajectory, shallow impact pits in the loose gravel soil and the total destruction of masses that did not impact rock but clay surfaces, may provide evidence that the meteorites did retain at least a fraction of their cosmic velocity until they hit the ground at an altitude between 1500 and 1600 meters. Approximate trajectory according to eye witness reports and meteorite find locations according to finder’s GPS data given in red. Map: public domain, courtesy of Texas University. At present (February 2009) a total of at ~13 masses totaling ~77 kg can be considered confirmed. As most masses were recovered in the shape of many fragments the exact number of recovered specimens is hard to establish. Several other masses of unknown weight have been reported, thus no second source was able to confirm these additional masses in photo, of which one was said to have a weight of 87 kg. The largest mass confirmed until present fragmented on impact on the flank of a limestone outcrop and was shattered into many hundred pieces. These were distributed in a half circle around the impact site up to a distance of 10 meters. Several other masses fragmented on impact. Among these a specimen of ~400g of which seven fragments were recovered. After reassembling this meteorite showed the shape of a delta or short boomerang, with thin flanks, but with no apparent signs of orientation (see 2nd image on this page). About 95 percent of the meteorite was recovered. Other more or less intact specimens found include a 3800g, a 2007g individual, a 1514g and a 1407g individual, all with impact marks and less than 5 percent of their complete mass missing. Cut sections of the Tamdakht meteorite show a chondritic matrix with small chondrules which are hard to spot. Particularly on fragmented surfaces the chondrule patterns fade with the busy dark ash-grey and blue matrix. Several of the specimens recovered show slickensides indicating a shock event on the motherbody.